Sponsors For This Project: First Mate, Inc. 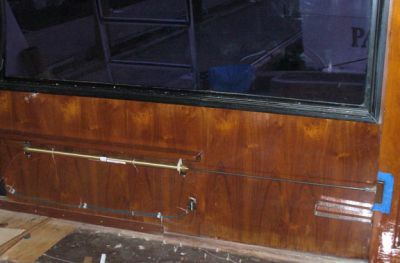 The door on this boat, like most, is very heavy teak and glass. The door slides open and closed which is by far the best choice compared to a hinged unit. However, this size and weight of door can be a problem and even a saftey hazard in big seas. 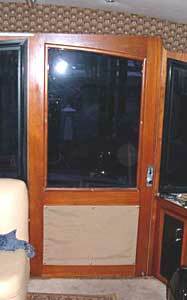 The solution is to install an automated door system from First Mate Inc. This is a proven air actuated system that utilizes a silent air compressor. I have seen boaters use other manufactuers who tried to copy this system. They thought they would "save some money" but they had nothing but problems and spent more before they were done. Furthermore, most were not finished before removing the "copy" and installing First Mate! 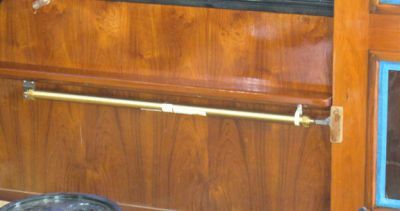 The "First Mate" air cylinder is installed. Some companies have used electric with gears etc., but the air cylinder seems like a much better choice on a boat. The door can still be opened and closed if the air is off. There are no gears to jam. The system is now up and running. We made several easy adjustments to get the speed and ease we wanted for opening and closing this sliding door. This system works nicely! The outside opening button has been installed, however the inside is laying on top the counter until we finish the Corian work. 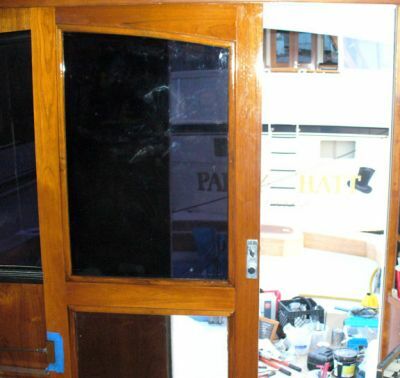 The lower left is a small PC of teak added for the installation that has now been varnished.